Mr. Holmes gets at the elusive nature of truth in fiction. Created in the Victorian era by Arthur Conan Doyle, Sherlock Holmes not only persists into the 21st century but is altogether ubiquitous, with manifold versions of the character appearing across every conceivable media. Whether updated to contemporary times in TV's Sherlock (with its acting power couple of Benedict Cumberbatch and Martin Freeman) and Elementary (with Lucy Liu as a female Dr. Watson), or transformed into a wisecracking action hero by Robert Downey Jr. in Guy Ritchie's film franchise, Holmes seems infinitely malleable and persistently appealing -- a detective for all ages and audiences. Bill Condon's Mr. Holmes, adapted from a novel by Mitch Cullin, offers yet another alternate take on the character. Here Holmes is 93 years old and long retired to beekeeping on the English coast, in a film that's far more contemplative, serious-minded, and leisurely than its hyperactive kin of recent years. Like its aged protagonist, Mr. Holmes is mature, a work deliberately pitched to adult rather than adolescent sensibilities. Primarily set in 1947, the film adroitly employs a tricky flashback structure, toggling back and forth between that year, the recent past (a journey to Japan from which Holmes is returning in the opening scene), and 30 years previous. Slow-moving and unsteady, Holmes in 1947 (Ian McKellen) is physically compromised, and he requires tending by a somewhat dour housekeeper, Mrs. Munro (Laura Linney), and her alertly curious young son, Roger (Milo Parker). Even more dismaying, although he retains many of his deductive powers, Holmes' memory has begun to fail, and his search for a restorative cure -- a compound from a rare Japanese plant -- served as the impetus for his trip to the Far East. Holmes is naturally distraught by his periodic inability to recall even the most basic of facts (names especially escape him), but he's more specifically concerned with recollecting his final case, whose unfortunate conclusion prompted his retirement. John Stow Courtesy of Miramax and Roadside Attractions. 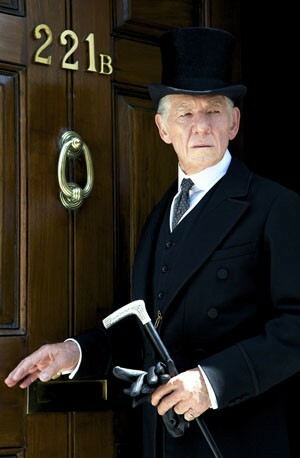 Ian McKellan stars as an aging Holmes. Holmes needs to haul up the details from his well of memory -- one partially filled bucket at a time -- because he wants to correct the fictionalized account written by Watson. In the case in question, the detective was engaged by Thomas Kelmot (Patrick Kennedy) to follow his melancholy wife, Ann (Hattie Morahan), who's still grieving two children lost to miscarriage. Kelmot fears that she's being unhealthily influenced by an instructor in the art of the glass harmonica, an instrument whose study, intended as a distraction, has turned into an obsession. In Watson's story, a tidy but illogical resolution is offered, with Holmes typically triumphant. The just-the-facts memoir that Holmes is slowly putting to paper -- with Roger eagerly reading as the pages accrete -- tells a different story. Even though Holmes knows that Watson's version of the case is hokum, he struggles to remember what actually occurred, and his pursuit of the elusive truth drives him in much the same way as the loss of Ann's children governs her own actions. Their fates, as the film eventually reveals, are intimately intertwined. Mr. Holmes thoughtfully explores many subjects -- the importance and unreliability of memory, the ravages of age, the need for empathetic understanding and sympathetic companionship. What it dwells on most, however, are the uses (and misuses) of fiction: The film is a disquisition on storytelling. Throughout the film, Holmes makes explicit commentary on such matters, calling Watson's tales "penny dreadfuls," albeit with a literary gloss (which is a fair assessment of Doyle's work), and extolling the virtues of nonfiction. But by Mr. Holmes' finale, he recognizes the value of fiction in a kind gesture that makes the Japanese story strand, which till that juncture seemed oddly superfluous, belatedly essential. Mr. Holmes thus offers its own version of the all-ends-tied happy ending, even providing a pleasing solution to a late-arriving mystery that's wonderfully foreshadowed in the film's first scene. Mr. Holmes, my dear Watson, proves far from elementary. Mr. Holmes Directed by Bill Condon. Written by Jeffrey Hatcher and based on the novel by Mitch Cullin. Starring Ian McKellen, Laura Linney, Milo Parker, Hiroyuki Sanada, Hattie Morahan and Patrick Kennedy. 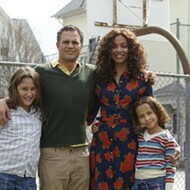 Opens Friday, July 17, at the Landmark Plaza Frontenac Cinema, 1701 South Lindbergh Boulevard. Call 314-995-6285 or visit www.landmarktheatres.com.